Fall is officially here. If youre planning any outdoor gatherings this autumn, you'll want to decorate your patio or garden area to reflect the natural beauty of the season. Here are some tips on how you can stun your guests (or your family, or even just yourself if you feel like it) with your garden fountain this autumn. Pumpkins. Can you say pumpkins? Good. Next to fall foliage, pumpkins really set the mood for the season. 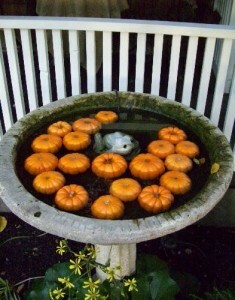 Mini pumpkins make a gorgeous addition to your garden fountain- particularly if you float them in it. Lights. If your outdoor fountain is part of a pond in your yard, the addition of lights- whether clear or colored- would also be spectacular. If you dont have a pond (or even if you do), stringing up Halloween lights (such as white, purple or orange) from your trees, hedges or patio area will give your party area a surreal, yet stunning, effect. Dont be afraid to let your creative juices flow when decorating your patio for fall. There are so many possibilities for how you can set the mood- whether you want to create a scary atmosphere for Halloween or merely invoke visions of the Harvest, one thing is for sure- decorating your garden fountain and patio area is fun!